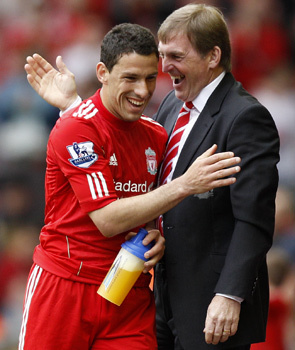 Will Maxi and Kenny be all smiles on Sunday? Whisper it in Portugal, but the Europa League is all but dead. The competition is flat lining, killed off by its elder, wealthier brother. Uefa’s latest attempt at cosmetic surgery has failed. The Inter-Cities Fairs Cup, Uefa Cup, Europa League – call it what you want – has had its day. It is a minor backstreet production unable to escape the shadow of a Broadway smash that is devoured by millions worldwide. Thousands of Portuguese fans will descend on Dublin’s shiny new Aviva Stadium for the final on Wednesday May 18th when SC Braga face FC Porto in the final. The clubs from two charming cities in the north-west of the country are desperate to get their hands on Bertoni’s creation – a striking trophy the Italian silversmiths designed and crafted for the 1972 final after the competition’s first name change. The rest of Europe cares not a jot; they are waiting for the main event 10 days later when Manchester United face Barcelona at Wembley. Sponsors, television big-wigs and Uefa’s top brass could not have scripted it any better: they have their dream final, and the Iberian head-to-head in Ireland will slip under the radar. Club owners are desperate to get a slice of the Champions League pie. The financial rewards are huge and every player craves the kudos that comes with playing regularly in world football’s premier tournament. Many have argued that Leeds United’s spectacular descent down the football league ladder was caused by their desperation to establish themselves at Europe’s top table. To many armchair viewers the Uefa Champions League is the only show in town. Purists look back at the old European Cup with its straight knockout format and despair at the current bloated set-up. The efforts of Michel Platini, the Uefa president, to encourage participation from the continent’s smaller nations have been admirable but the same heavyweight super-clubs from Spain, Italy, England and Germany are generally the teams trading blows in the last 16 and beyond. The Frenchman’s new financial fair play rules could upset the status quo when they kick in, but nobody really anticipates a Scandinavian, Low Country or Eastern European finalist any time soon. In the 1970s and 1980s, the continent’s most talented and up-and coming teams often competed in the Uefa Cup. The great Liverpool side that beat Bruges in the 1976 final went on to win the English First Division that year, and both triumphs were greeted with equal delirium on Merseyside. The European Cup, won by Bayern Munich, was arguably an easier competition to sweep. In 1989 Diego Maradona’s Napoli were considered by many to be the best club side on the planet when they lifted the Uefa Cup. AC Milan won the main European event comfortably, but were no match for the Neapolitans in Serie A.
Liverpool and Tottenham Hotspur meet at Anfield on Sunday in what is potentially a shoot-out for the final Europa League slot. While there is no question of either team, officially anyway, wanting to lose out on fifth place, sixth might be a better launch pad for next season. Tottenham’s foray into the premier European competition has given their success-starved fans and ambitious board of directors a taste of the big time. Five-times European Cup winners Liverpool belong in the Champions League. The tournament defines them as a club. The ban on English clubs competing in Europe after the Heysel tragedy in 1985 hit Kenny Dalglish, then as now the club’s manager, harder than most. After three European Cup wins as a player Dalglish would dearly love to pit his wits against the real heavy hitters as a manager, but the Europa League is a headache he can live without as he plots a top-four finish in the Premier League next season. Both Liverpool and Tottenham, with three and two Uefa Cup titles respectively, know that any aspirations of finishing in the top four next season will be hindered by the slog of Thursday night matches. The decision to move games to Thursdays has clearly had a detrimental effect on planning and rest ahead of weekend domestic fixtures. Even a solitary season without Champions League action can tear a squad apart. Fernando Torres was able to pursue and ultimately complete his transfer from Liverpool to Chelsea and Redknapp may find it impossible to keep Luka Modric, Gareth Bale, and possibly even Michael Dawson now they are established performers at that level. The final shred of credibility was surrendered when Champions League drop-outs were parachuted into the Uefa Cup. Surely a team finishing third in a Champions League group has no sporting right to gatecrash another competition. This farcical get-out clause has enabled Braga to qualify for this season’s Europa League final. The previous two victors, Atletico Madrid and Shakhtar Donetsk, were also Champions League flops. It makes a mockery of the whole event. The final itself could well be a decent spectacle. Porto, under the stewardship of Andre Villas-Boas, a former Jose Mourinho disciple at Chelsea, are unbeaten in the league and ran away with the Portuguese Super Liga title. The 33-year-old coach has assembled a formidable squad built around explosive strikers Falcao and Hulk, a £60m-rated frontline that has left Premier League scouts salivating. The Dragons’ stunning 7-4 aggregate semi-final win over Villarreal was a much needed shot in the arm for the competition. Braga are another formidable attacking force as Arsenal, beaten 2-0 at “the Quarry” in November, can testify. A squad awash with Brazilians, 12 in total, would love to land their first major European trophy at the expense of their neighbours. Peruvian Alberto Junior Rodriguez, the club captain, marshals a defence that neutered Benfica in the last round. They might find Porto too strong as a genuine inferiority complex sometimes hits Braga when they meet their more established compatriots. The Costa Verde region will grind to a halt as Portugal forgets its economic woes for 24 hours on Wednesday. Stoke City and Birmingham City supporters will be looking to emulate Fulham’s recent fairytale campaign when they debut in August, but the lustre has gone. Manchester City did not sell out Eastlands when Juventus came to town in September. The group stage is a farce with the Channel 5 and ITV4 broadcasts attracting dismal viewing figures. Those of us who remember Tony Parks’ decisive penalty shoot-out save from Eidur Gudjohnsen’s father, Arnor, that clinched the 1984 trophy for Tottenham against Anderlecht or Dundee United’s heroic defeat by Gothenburg in the 1987 final will always cherish Europe’s second competition. Ronaldo’s goal in the 1998 final in Paris is permanently etched in the memory. The Brazilian’s one-man show for Inter Milan against Lazio was probably the last truly great Uefa Cup final spectacular. Can the suits in Nyon reinvigorate this grand old competition one last time? If they don’t get it right, it could be time to bury the Europa League once and for all. There is a precedent. The Uefa Cup Winners’ Cup, once cherished, is already a footnote in the game’s annals. As an Ipswich fan I look back to the Az Alkmaar final of 1981 and reminisce. Joyous, as a Town fan. Agreed it’s a joke of a cup now. But the 80′s were a Golden age of trophy snaring from Clough to Burkinshaw to Paisly to Robson. V good. Sweet Mr H. Better away days in the Europa for the fans though Sean. Give me Prague, Bratislava or Hamburg over Milan or Manchester any time. Maybe King Kenny read this and threw the games against Tottenham and Villa. Another brilliant article on this site. Just who did win the Europa League anyway? Hopefullly the Thursday night problen being removed helps the reds and hits Spurs. I think both Norwich and QPR may contest that Liverpool were hit worst than most by their fan-induced English-wide European competition ban. Both qualified and were subsequently denied a place in Europe in their prime. That said, the main thrust of your argument is spot on: Thursday IS, and always should be, a day of rest. A very well written article – I agree that this once well-respected competition is being killed off by the (cash cup) Champion’s league. The old UEFA cup used to involve teams who had finished second, third or fourth in their domestic leagues…now mid-table teams qualify for the Europa league! The group stages are also a bit of a joke with groups of five teams and the lack of home and away fixtures against each opponent – what sort of a ‘league’ is that!? The addition of ‘losing’ Champion’s league teams later in the competition adds to the farce.